Radio talk show host Chuck Morse is scheduled to weigh in on the current Arab/Israeli controversy in an address before the student body at the Murray D. Lincoln Campus Center on Tuesday, May 7, 2002 at 7 p.m.
Morse will frame today's battlefield in the Middle East as a civil war between two Palestinian peoples, the Jews and the Muslims. Outlining the 6,000 year history of the land, Morse recreates the tensions and often tumultuous existence of its inhabitants. Morse points out that UN Resolution 242 doesn't require Israel to withdraw to the 1949-1967 armistice lines, borders that Israeli Foreign Minister Abba Eban referred to as "Auschwitz lines." Morse draws from past presidents of the United States to pinpoint the moral distinction between the free world and enemies of freedom. Without hesitation, he acknowledges Arab suffering but argues that the Jews are entitled to the land of Israel. He will conclude his speech with criticism of the White House's impassive response to the recent suicide bombing near Haifa, hoping to provoke the audience into a lively exchange of viewpoints during the subsequent Q&A. The Chuck Morse Show is heard during afternoon drive time in Boston on Salem Communications Radio WROL 950 AM. A self-described genuine, god-fearing, Jewish conservative, Morse uses his show as a forum to bring the issues of the day into full view, unclouded by the "tyranny of political correctness." Guests on the show have included former Secretary of Defense Caspar Weinberger and gubernatorial candidate and former U.S. Labor Secretary Robert B. Reich. Morse's third book, "The Difference Between Us and Them," will be released in May. Starting April 29, his show will be heard at 5 p.m., directly following The Ray Flynn Show, Boston's "Ambassador of Talk." Formerly The Chuck Morse Show was heard nightly at 7 p.m. The National Education Association concealed its use of millions of dollars in tax-exempt teachers' dues and fees for political activities, primarily for Democratic candidates and causes, according to a complaint filed by the Landmark Legal Foundation. In its complaint to the Labor Department, the foundation claims the NEA  the country's largest labor union  did not report to its 2.7 million members tax-exempt revenue it spent to recruit and support candidates running for local, state and federal elective office since at least 1994. Most of the expenditures were coordinated with the Democratic National Committee (DNC), Democratic Party campaign organizations, the AFL-CIO and Emily's List, the nationwide network of political donors helping to elect Democratic pro-choice women, the complaint said. "The NEA obviously doesn't want America's teachers, parents and taxpayers to know how it is using tax-exempt membership dues and fees," said Mark Levin, the foundation's president. "But federal labor reporting laws require the union to tell the truth, the whole truth and nothing but the truth about its political activities and expenditures." Levin said the action violates a federal law that requires labor unions to report their revenues and expenditures annually to the Labor Department. Unions must report their financial activities in enough detail to accurately reflect the union's operations, they say. NEA officials called the complaint "completely baseless." "This complaint is without merit," said Kathleen Lyons, a spokeswoman for the union. "NEA is very careful, very meticulous with our paperwork. We follow all the rules and procedures. There is completely no basis for this complaint." NEA's failure to report the expenditures makes it impossible for its members to determine the full extent of the union's political activities, foundation officials argue. A union and its leaders could be held liable for substantial civil and criminal penalties for violating the labor law. "The law was enacted to ensure that union members could make informed, responsible decisions about their union's leadership and its activities," Levin said. "The NEA's leadership spends millions of tax-exempt dollars on political activities ever year, in coordination with the DNC, yet reports none of it on its Labor Department filings." The complaint was the fifth filed by the public interest law firm since the mid-1990s. The foundation filed several complaints with the Federal Election Commission and the Internal Revenue Service. In the IRS complaints, Landmark claimed that the NEA and its state chapters violated their tax-exempt status consistently by engaging in politics and campaign coordination activities with the Democratic National Committee. Landmark argued in the complaints that since 1994, the NEA has reported that it has made no such political expenditures on its tax returns. By law, a labor organization is allowed to engage directly in political activity if it fully accounts for political expenditures and activities and reports them to the IRS as taxable income. In its complaints, the foundation said the NEA's 1998-2000 strategic plan and budget earmarked $350,000 for training programs that strengthen organizational capacity to support elections of pro-public-education candidates. An additional $540,000 was allocated for developing a "national political strategy" that would address congressional and legislative redistricting, campaign finance reform, candidate recruitment, early voting, and vote-by-mail programs "in order to strengthen support for pro-public education candidates," according to Landmark records. 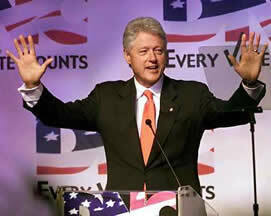 Bill Clinton has talked with NBC executives about becoming the host of his own daytime TV talk show. The meeting took place on May 1 in Los Angeles, according to a television industry source who spoke on condition of anonymity on May 2. A Clinton spokeswoman, Julia Payne, said the former president has met with various people over the past year about potential projects. "President Clinton did not demand a talk show," Payne said. "He went to listen. The president is gratified by the range of opportunities that have been presented to him." Her statement gave no further details. NBC had no comment. The Los Angeles Times, which first reported the discussions, quoted a source as saying Clinton was asking for a fee of $50 million a year. It cited unidentified industry sources as saying he was not seeking a political talk show because of potential conflicts of interest with his wife, New York Sen. Hillary Rodham Clinton. It would remain to be seen whether he would dive into more traditional daytime fare like celebrity interviews, "boot camps" for troubled teens or beauty makeovers. Oprah Winfrey, the current queen of daytime talk, recently signed a contract extension but said she would quit her show in 2006. The show reportedly generates $300 million in revenue each year, and she's paid more than $125 million a year to be host. Daytime talk show ratings are generally down this year and two prominent hosts, Rosie O'Donnell and Sally Jessy Rafael, are ending their shows. Winfrey and, to a lesser extent, O'Donnell, have parlayed their talk show careers into multi-media empires, including their own magazines. There was a broadcast report the week before that CBS or Clinton had expressed interest in the soon-to-be-vacant job of host of that network's morning news show, "The Early Show." "There is not one ounce of truth to that," said CBS spokeswoman Sandra Genelius. Freedom House's annual survey of press freedom found slight gains around the globe, in spite of challenges posed by the Sept. 11 terrorist attacks and governments' responses to them. May 3 was World Press Freedom Day, celebrated every May 3 since first adopted by the United Nations in 1991. A non-profit promoter of press freedom and civil liberties, Freedom House said that while some democratic states have restricted access to information, press freedom per se has not been affected since Sept. 11. This year's survey of the world press was dedicated to the memory of slain Wall Street Journal reporter Daniel Pearl. Of the 186 countries surveyed in 2001, 40 per cent have what Freedom House considers to be a free press. That compares with 38.5 per cent of the 187 countries surveyed in 2000. The 75 free-press countries comprise 22 per cent of the world's population. Countries rated "partly free" with some restrictions on the media made up 27 per cent of the survey (28.3 per cent in 2000). These countries represent 40 per cent of global population. Sixty-one countries (33 per cent) do not have a free press, about the same per centage as the prior year. The "not free" nations contain 38 per cent of world population. Freedom House cited the following countries for notably improving press freedom: Ghana, Peru, and Vanuatu. Meanwhile, Bangladesh, Haiti, and Mongolia received downgrades in the survey. The entire survey is available online at www.freedomhouse.org. About half of all Americans feel no more safe and secure from terrorism today than they felt immediately after the Sept. 11 attacks on New York and Washington, according to a national poll by the Institute for Social Research at the University of Michigan. The survey's results also suggested that public confidence in key institutions, which had surged immediately after the terrorist attacks, may be ebbing. The poll tracked the changes in attitudes of 613 randomly selected adult Americans who were first interviewed in a survey conducted by ISR right after the attacks. Nearly four in 10 -- 37 per cent -- said in both surveys that the incidents had "shaken" their sense of safety and security "a great deal" or "a good amount." About one in 10 -- 11 per cent -- said they were feeling even less secure now than immediately after Sept. 11. Thirteen per cent were feeling more secure. The remainder said in both surveys that their feelings of personal safety were unaffected. "The attacks were a sharp jolt, and many people aren't feeling better," said political scientist Michael Traugott, a senior research scientist at ISR who directed the studies. One key finding: The more closely individuals said they followed the news, the more insecure they felt, suggesting that government efforts to warn people of potential attacks may be sustaining public unease, Traugott said. The second survey also found that 42 per cent of Americans had become more concerned than they were last fall that they might be injured in a terrorist assault. An even larger proportion -- 80 per cent -- expressed concern that other Americans might get hurt, the survey said. An overwhelming majority -- 84 per cent -- also considered it at least somewhat likely that terrorist attacks or similar acts of violence would occur in the United States "in the near future." One in four expected that such attacks would happen in their community. Researchers also measured how specific behaviors were affected by Sept. 11. "Among those who ordinarily engaged in the particular activity, 69 per cent said they were more concerned about their safety when taking an airplane trip, while about 37 per cent reported heightened safety concerns while attending a sporting event, and 22 per cent said they had become more concerned about their safety when going to a shopping mall," Traugott said. These fears have consequences, Traugott found. Seven in 10 Americans said they were willing to give up at least some of their civil liberties to improve security -- and "the number goes up to the eighties among those who said they were concerned about their personal safety," he said. Last fall's survey found virtually identical levels of willingness to surrender civil liberties, he added. According to the lastest poll, nine in 10 Americans favored having more police assigned to patrol public places and additional powers to permit the military to work with local police to conduct anti-terrorist activities. Seven in 10 supported a law requiring all adults to carry a national identification card that would include their photograph and Social Security number. About half said they supported random police searches in public places, while fewer than half favored allowing wiretaps of conversations between terrorist suspects and their attorneys. One in four -- 24 per cent -- supported giving police the power to conduct random searches of "anyone who appears to be Arab or Muslim." The survey also suggests that the public's confidence in major institutions, which surged after Sept. 11, is on the way down. Although questions measuring confidence in institutions were not asked in the first round of polling, Traugott compared the results of the second wave with the findings of other surveys that included confidence measures. About seven in 10 -- 73 per cent -- reported that they had "a great deal" of confidence in the military. But only 16 per cent expressed similarly high levels of confidence in Congress, 30 per cent in the executive branch, 34 per cent in organized religion and 11 per cent in major companies. The survey did not measure overall trust in the federal government or confidence in President Bush, both of which rose after Sept. 11. "In times of crisis, a 'rally round the flag' phenomenon affects attitudes toward institutions, just as it affects presidential approval ratings," Traugott said. "But these findings suggest that this positive attitude is beginning to wear off."